Was trying to remember with friends last night the names of the old shops in Hucknall high St when i was a kid. Can anyone fill in any gaps please? 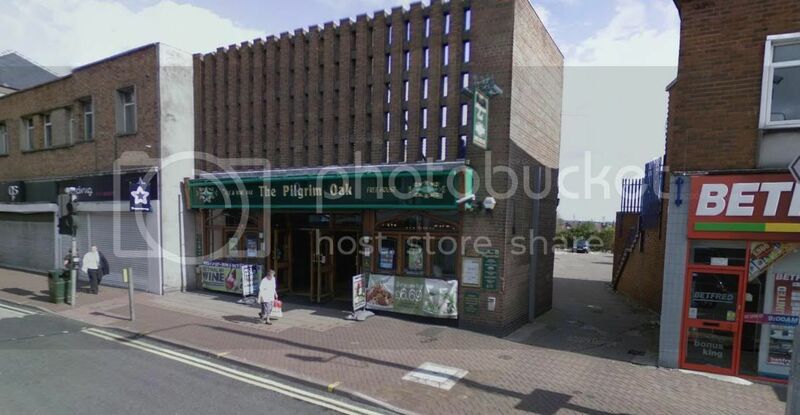 Before The Pilgrim Oak (Wetherspoons), the building was a Co-op but before that it was an old building which housed 'Fords the family Store' which had Vince Dickens dancing school above it. Must have been knocked down late 60s and the new Co-op supermarket was built which turned into 'The 'Grim' in the 90s. Fords then moved further down the High Street to what it now Jack Fultons. Cant remember what else was in that stretch except Fine Fare which was then another supermarket, which turned into Mr Cool, then Farmfoods and now Peacocks, next door to Fine Fare was Rediffusion which is now Done the Bookmaker. Between Fords and Barclays Bank was a shoe shop (cant remember the name) and then across Woollaton street it was Hartwells fruit & veg shop (then Dewhurst butchers) think its a tanning shop now. Across the road was Johns army stores, 'Dine Out' and I think Baileys pot shop? Also im sure was a Clarkes dry cleaners?? Pork Farms was on the corner of Watnall Rd and High street and on the opposite corner was Sketchleys. Then Nellie Ricks which is now 'Cheapest Cigs' a few gaps then Gas showrooms which was next to Nottingham Building Society who then bought out gas showrooms and doubled its size in the early 90s. Dont know what was where Bon Marche is now but Yorkshire bank is a fairly new building and it used to house 'Central Garage'which then moved onto Papplewick Lane. Further down on the same side next to the Post office was 'Dorotheas ladys clothing shop'(now Ladbrokes), and a butchers shop?? Opposite is the Red Lion not sure what was where The Gold Shop is now, but at the bus stop was Brittanic Assurance, Wighay Plumbing, Parrs butchers. across Titchfield street on the corner was Liptons (maypole? ), Midland Bank, Wakefields furniture store, Crawleys jewellers, Boots (still there) and across Albert St was Woolworths which, when it closed was split into 2 shops, Bewise and next door Superdrug now stands. Phew, can anyone fill in any gaps for me please? I can remember Highams/Stallards on Chapel street which is now empty, and Mrs Peppers sweet shop. 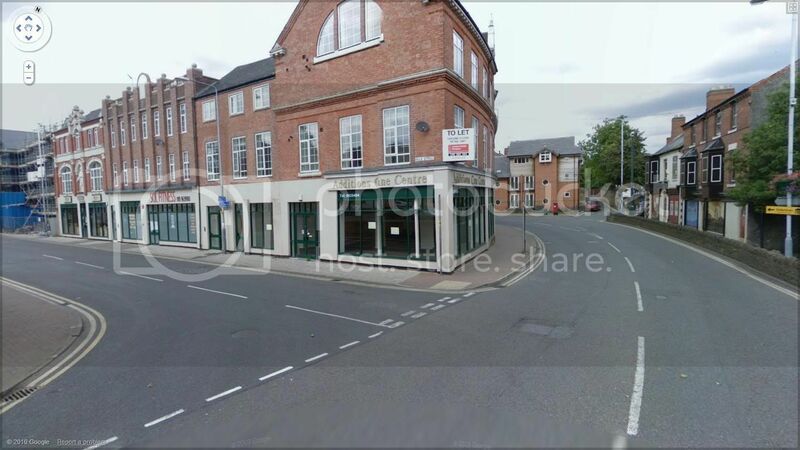 You can see Hucknall High Street today on Google Street View. Coop Watnall Road/Nabbs Lane, Gone, but the replacement can be seen in the distance. It was a two story building where the single story buidings on the right are now. Interests:Football, Golf and other sports. Enjoy the pub atmosphere and going out for a nice meal. ahill1936, my name is tony and have been reading your report about Hucknall. Mrs Peppers sweet shop on High St. was next door to Woolworth's. At the side of where Fine Fare used to be was Pat Griffin gents hairdresser. Bailey's pot shop was on High St, immediately opposite Mrs Peppers and next door (Watnall Rd Side) was George J Mason grocery shop belonging to a Birmingham company. The manager there in 1952 was a Mr George Skinner. Other large grocers at that time were John Shenthall's and Maypole. Where Pork Farms used to stand at the bottom of Watnall Rd used to be May Bullin's paper shop, who was the sister of Mrs Bailey at the pot shop. The Central Garage where Yorkshire Bank now stands was owned by a Polish chap named Steffan. Where the Red Lion pub still stands, approx half way towards the market place on the same side stood the Masons pub, which is now situated at the bottom of Ruffs Drive. There's loads more info to recall and I hope this was of interest! Feel free to add your recollections of Hucknall and Notts in general. Welcome Tony, thanks for your post. I certainly remember the name above. I believe Steffan was a friend of my mum's family. The family lived at the corner of Montague Road and Annesley Road. Used to visit their as a youngster a bit to see family but wasn't often allowed down the High Street. A couple of names I remember a bit further up Annesley Road were 'Reaney's' greengrocers and Hargreaves shoe shop and repair. There was a newsagent facing Reaney's too which I wish I could recall the name of. A veritable den of great comics for me! Welcome to Nottstalgia, TonyH. I look forward to reading more of your posts. It's always good to have new members sharing their memories. Hi Tony, is that the same Mrs Peppers sweet shop that used to be opposite the market place ? Did she move from the high street to there? I really cant remember it being in the High Street? I seem to remember a shop at the bottom of watnall road called Bettridges that sold undergarments! and my uncle, Les Johns, used to work in the co-op on the opposite side of watnall road which is now JRs gym. Tony, just a thought, did you know Alan Drage? daves mum was born and sent her first few years living in her grand mothers generalstoreson whatnal rd just above the police station later it became a spar shop owned until a couple of years ago by the family who brought it of her in the 50s . if you go in the hucknal libary and look in the local history deptment they have a copy of a photo of daves mum and her gran taken in 1920/1921ishthat we gave them i have the original in my family history albums i put in any family photoes plus any information i have about that person so that family members in the futurehave that info plus a photo of the person as far as posible. Tony, did you know Allan Drage? 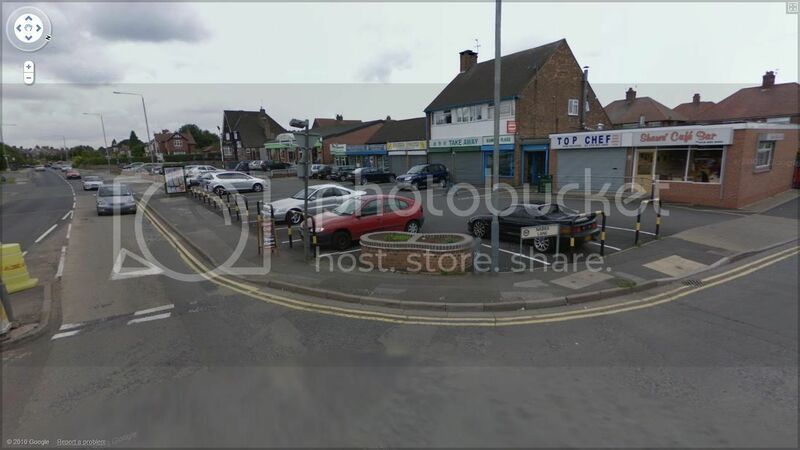 I used to live on Hanson Crescent in Hucknall,(in the 60's) and as I remember Watnall road and the High Street from Slaneys opposite was, and still is Annie Bransons, and a small paper shop. Green Dragon....used to be run by my friend Deborah Bishops parents, remember going to many a birthday party there. Further down the road, just after the Beardall St junction (I went to Beardall Infants) was Henry Paulsons, green grocer, George Hansons, still there. Houghtons (pronounced Hootons...or probably 'ootons then!!) a small grocery shop where we always bought our bread. Small stationery shop bit further down (name escapes me at the moment) opposite Jack/Hedley Wrights, fish and game shop. Pork farms on one corner, Sketchly on the opposite corner. Turn right towards Bullocks and yes I remember Dine Out too, I used to work there for a while for pocket money while I was at college, was run by Jesus, (pronounced achsoos according to himself but everyone called him Jesus!). Bit further down was the Plough where I used to go to the upstairs room to watch groups such as Judas Priest in the 70's, and learned to play pool downstairs, often for free if you knew the trick!! Back up the High Street Barclays bank on the right, Fords a bit further on and then Finefare, Woolworths, Frank Sissons. Across the road I remember Nellie Ricks (Knitting wool?) Doretheas (Posh frocks?) a redifusion somewhere? not sure which side. Pet shop Post office, Stallards.Over the road and round the corner Mrs Peppers opposite the Market place, and the Methodist Church a bit further down the road, a vets a bit further just before you get to Annesley road.. Co op along the side of the market place, opposite the library. Don't ever remember Central garage being on the High Street, as Susyshoes says, only on Papplewick Lane. All the above...now Tescos...300 new jobs,unfortunately at the loss of about 2000...but hey ho!...Councillors know best. Don't ever remember Central garage being on the High Street, as Susyshoes says, only on Papplewick Lane. If I remember correctly, it was a typical old-fashioned car showroom with workshops at the back. They completely rebuilt it in the early 70's (?) but it never reopened. The new building eventually became the Yorkshire Bank. Was Central garage just down the road from the Post office, opposite Frank Sissons? I have a hazy memory of something set back, some sort of workshop, probably where you can walk up to the car park on Piggins Croft now, next to Wilkinsons. There used to be a little path up the side to the old croft before the council slapped a compulsory purchase order on it. Our house used to back onto the croft and we used to play there. Scrumping apples and fishing for tadpoles in the brook that ran through it....All that and I was only 5 when we left!!!! That's great thanks. Its good to get the old memory straightened out, it's amazing what came flooding back once I started to think about it properly. they even told me what granny had paid for the shop and how much it was sold to them for. and how much itcost to rent the shop from her before she eventually sold it to them for.. granny must have been a verygood business woman when she moved into the shop she was seperated from her husband and had 4 young children to bring up after her husband deserted her leaving her destituit luckily her parents took her and the children in at the time of her death in 1972 aged nearly 100 she owned 2 shops and several houses. but she must have worked really hard to get them. I notice that the Byron on the corner of High Street and Station Street is now a Bingo Hall. We lived in one of the new estates in Papplewick with the Colliery just a walk away, all hosing estates now. Did my brothers paper round a few times (newsagent at the corner of Watnall Road), now a caff I think.